Premiere of Psalm 150 This Weekend: this piece will be loud. YeeHA! – I get to visit my Alma Mater, Conrad Grebel University College and while I’m there, hear the choirs of the University of Waterloo perform Psalm 150. The choirs will be accompanied by Catherine Robertson on piano, my old teacher Marlin Nagtegaal on organ, Deb Lacoste on trumpet, and Carol Bauman on percussion. Mark Vuorinen heads up the event, also Ken Hull and Gerard Yun will be directing at this concert. Looking forward to the event and to visiting with many old friends! Warm words of encouragement and support for everyone in the Vancouver Peace Choir as you prepare for your concerts this weekend. Sara and I miss you all a lot and of course we miss singing together. It’s great to see the good work you’re doing, especial Dan Kocurek, the choirs new director… BREAK A LEG Dan. The concert also features the Eric Hamber Secondary School Chamber Choir, the Black Dog String Quartet and Meryn Cadell. All the best to Vic Pankratz and Prairie Voices! The MISSA PAX (Peace Mass) represents part of a personal journey, beginning with my early years growing up singing the high mass as an Anglican boy chorister and later as a young adult engaged as an activist. These two early stages left a deep impression on me: my formative years in the church still resonate deeply and often serve as a starting-point for musical expression; my years as an activist, regularly attending protests and radically engaging with concerns of social justice shaped my philosophy and caused me to see my childhood experiences with a different perspective. The Peace Mass is an attempt to come back to my high church roots and to use music as a way to reinterpret the liturgical tradition, to reconcile these very disparate worlds, to give the old habits new expression and new vitality. How to go about reconciling these two world-views? The church perspective often looks to meditative ritual practice and tradition for clarity. The activist viewpoint often reacts to the church, adopting a substantial (and often valid) critique of how the church institutions have used dogma and ritual to repeatedly abuse the public trust. I admit that for a number of years, attending church or participating in church-based rituals of any kind seemed like an absolute contradiction, particularly when I felt a strong compulsion to distance myself from any association with the well known church-related institutional injustices, past and present. So, instead of singing the mass, I went to the streets. Attending political demonstrations was a significant eye-opener. At the larger protests (sometimes as many as 200,000 demonstrators), I remember feeling disheartened to experience the disciplined resolve of a large contingent of peaceful demonstrators thrown off-the-rails by a handful of rowdy outliers. 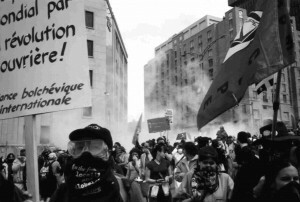 While hiding behind hockey masks and wearing volleyball knee-pads, these self-labeled anarchists provoked the rows of riot police. With the help of this violent catalyst, what began as a peaceful and powerful collective energy often digressed into a chaotic panic of teargas and water cannons. Experiences like these made me aware of how easy it is (if you decide) to step outside of the secure bubble of the ultra-privileged and to become a vulnerable outsider. Feeling this vulnerability was important, but the end result was a feeling of futility. Elitist dignitaries continued their meetings uninterrupted – the political message of unrest, as portrayed in the media served to polarize divergent viewpoints and ultimately reinforce the status quo. While these large-scale demonstrations did little to change the world, they were powerful experiences from a personal and ideological point-of-view. There were many similarities to church in the use of music – the aesthetic was different but the similarity was in the function: drumming, dance and folk music served both as art form and as a rhetorical and ritualistic device. Buskers created an atmosphere of celebration and allowed for strangers to band together under a common banner of aesthetic cultural identifiers. Drumming raised adrenaline levels and focused the energy of the crowd towards a common goal. Ten’s of thousands of people marched in an unscripted, yet orderly way towards rows of riot police by chanting “So-So-So Solidarity” as they marched. Such observations about function and form might have led me to a cynical stance – throwing hands in the air in an acknowledgment that both ritualized contexts were a product of crowd-think mechanisms, essentially dogmatic, self-indulgent, and insular – if it were not for a specific personally transformative experience involving both the activist and church communities. The transformative event took place on Good Friday, 1999 outside the doors of St. Paul’s Anglican Church in downtown Toronto. By coincidence, this location was familiar to me. I had attended this church for many years with my parents as a youngster. I can still remember the vast towering Gothic arches and stained glass windows in the sanctuary and the old-fashioned gymnasium with adjacent upstairs Sunday school classrooms opening onto a narrow surrounding balcony – also the overbuilt thick stone walls and small windows in the classrooms. On Good Friday of 1999, I found myself participating as an activist in a protest designed to bring attention to the contradictions held within the church’s just-war theology, as represented in the World War I monument housed on the church grounds. 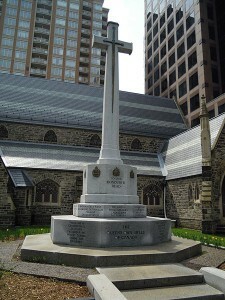 The monument was notable for a sword that was embedded at the apex of the cross. The demonstration was organized by three elderly men, each with close ties to the church community: Don Heap an Anglican Minister and former member of Toronto City Council, Bob Holmes a Catholic Priest, and Leonard Desroches a theologian and familiar church resource person for the exploration of non-violence. The attendance at the event was small, probably under 100 demonstrators. 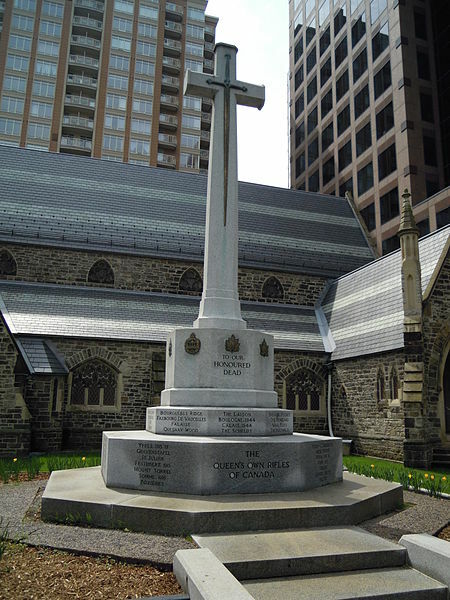 The small crowd marched peacefully through the Queen’s Park area of the city and eventually arrived at the war memorial at St. Paul’s. We sang a number of hymns and then these three older gentlemen, wearing their liturgical robes attempted to climb over the wrought iron spiked fence with the intent to physically remove the metal sword from the massive stone cross. These three organizers had spent years in prayer and preparation for this single act of civil disobedience. The symbolism of the act resonated deeply with the crowd of supporters but also was not lost on the assembly of roughly 30 police officers, some of whom must have felt foolish as they held their batons and shields. The police arrested the three demonstrators on charges of “mischief over $5000.” The memory that remained with me most profoundly was the image of a younger police officer, leaving his riot garb aside and in an act of kindness, gently helping the three frail demonstrators back over the fence. We sang the well-know protest song, “We shall overcome” as they were escorted into the police van. This experience, more than any other, served as a defining moment, a turning point in my slow journey back, towards the liturgical tradition. At a certain point, I came to acknowledge that much of the way I saw and experienced the world was influenced by the recurring themes of the ancient liturgy I had learned as a child. I became aware that my attempts to engage with the post-colonial critique were experienced largely through a reactionary guilt-complex, an impulse to separate myself from my roots. The Sword and the Cross protest and other experiences like it, would eventually provide the inspiration for the artistic project presented here, an attempt to re-enter the sanctuary and reconcile certain aspects of my high church tradition with a healthy criticism waged against it; that is, to put two loaded words together: MISSA PAX. This weekend’s performance of the Missa Pax in Waterloo, Ont. is one I’m very sad to miss. Sara and I sang under Len for many years both at Conrad Grebel University College and with DaCapo. It was a very special and formative time for us. DaCapo means “from the head” – Leonard is a director who brings tremendous depth and intellectual rigour to the performance and to the art of weaving a concert program. He also draws out the hearts of his singers during those spontaneous moments in performance. I often experienced this as a singer under his direction. A very warm THANK-YOU to Leonard Enns and to the choir, also to Catherine Robertson and Peter Shackelton. All the best this weekend to Tim Schantz and Luminous Voices, the brand new professional choir in Calgary. What an achievement to establish an ensemble like this. Very glad and privileged to play a small part in the beginning of this wonderful ensemble.